Jeans are an absolute staple in our daily lives. And if you’ve experienced the benefits of sewing your own clothes, you should be sewing your jeans too! 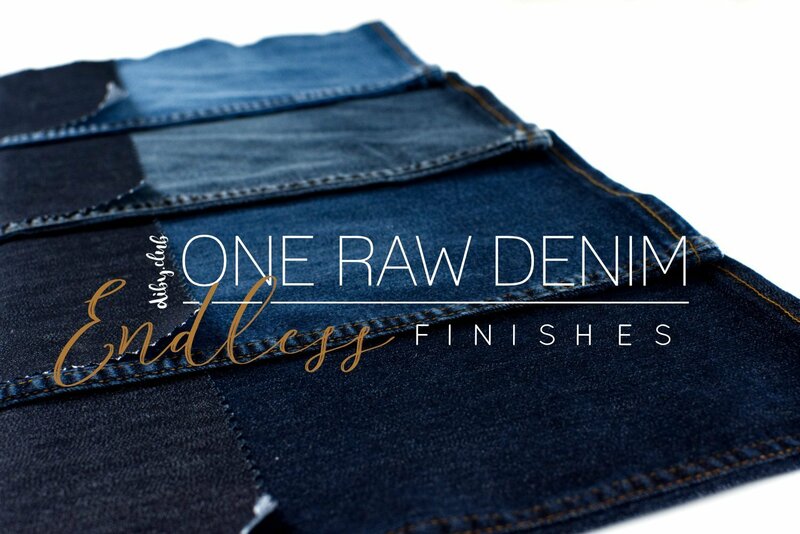 If you want the ultimate denim experience, you want to make your own jeans with raw denim. 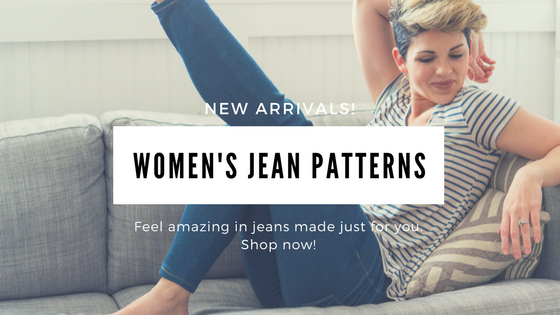 In true DIBY style, we have developed a line of women’s PDF jean sewing patterns to help you achieve that store-bought look! 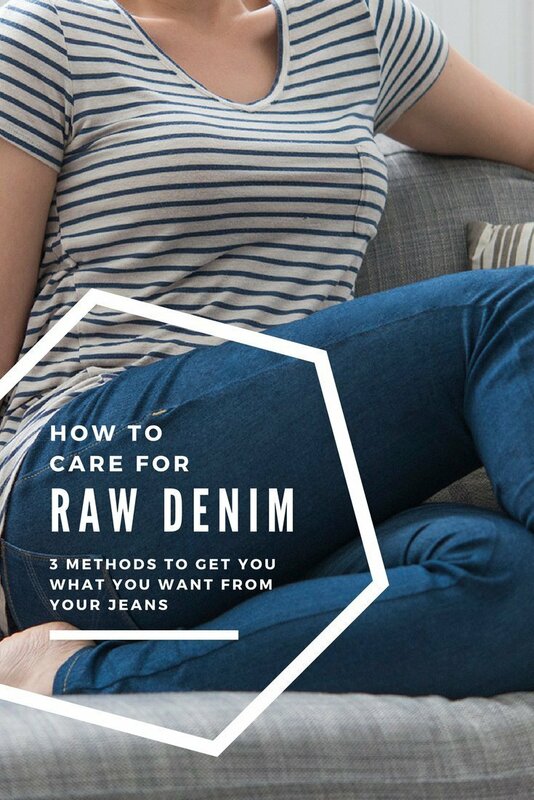 So don’t be afraid, grab yourself some raw denim and check out this guide to find out exactly how to care for it. Can’t read this now? Pin this image to save this guide for later! Don't want to read? Watch the video! But What Is Raw Denim? Most all of the denim jeans that are available to purchase in-store have already been washed or treated using various methods in order to give them that worn-in look and feel. Some jeans, however, are sold in ‘raw’ form. These ones tend to be more spendy. Ranging from $100-$400 a pair. Raw (or rigid) refers to the unwashed, untreated, unsanded, un-everything’d status of the denim fabric that jeans are made from. It is literally raw from the textile mill. If you are making your own jeans from yardage purchased from a fabric retailer, you are most likely purchasing raw denim material. This material has not been stonewashed, faded, put under a laser or distressed. Raw denim is rough and not very stretchy. In fact, it doesn’t feel all that wonderful at all. What gives? Well, just you keep reading. I am going to break down for you just how you will sidestep the apparel manufacturing process to use raw denim at home. The beauty of raw denim is that it can be handled so many different ways. It can be preserved, altered or left alone to create natural distress patterns. One raw denim fabric can be distressed and washed to create MANY color shades that look completely different from one another. Choosing which way you will care for a pair of brand new jeans is an essential part of deciding how you want your jeans to look. But it isn’t as easy as deciding the extent of distress on them. Lifestyle plays a vital role in this decision. Do you tend to move a lot throughout your day? Can you manage to keep your denim pretty clean on a daily basis or do you have small children soiling your clothes all day long? These are the things that will dictate how YOU can care for and customize your denim. So in order to make this a little more clear I’ve broken it down into 3 basic styling categories. This is the simplest and fastest way to prep and wear your denim. You will be doing more washing and will be sealing in your color to avoid dye bleeding. You like your jeans to be a solid color. You need to wash your jeans regularly. You like the original color of your denim without fading. 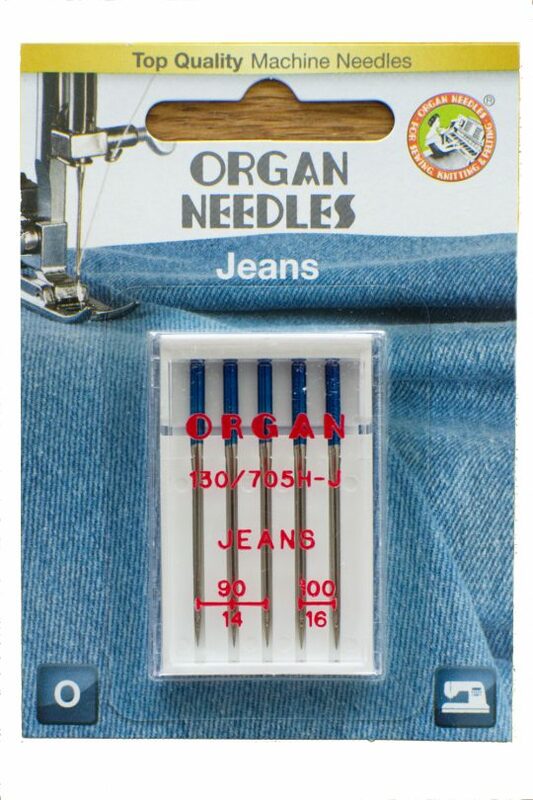 You want your jeans soft right off the sewing machine. This method requires the most patience but has the greatest payback. You will be breaking in your jeans to get fade lines that are 100% unique to you and your lifestyle. You like your clothing to be expressive of you. You are a denim enthusiast. You enjoy having a unique wardrobe. You want your jeans to last as long as possible. This method gives you a broken-in look without having to wait months breaking it in slowly. You will be intentionally damaging the fabric to give it a custom worn look. You like the look of worn-in jeans. You don’t have the patience to break them in. You are squeamish about not washing your jeans. You want your jeans to be one of a kind. Do you like the look of pristine solid-colored denim? This method will work to preserve the color of your original fabric while allowing it to significantly soften up. This is by far the easiest care method for raw denim. PREWASHING: Wash your raw material ALONE at least 3 times in a row in hot water to help remove most of the excess dye causing your fabric to feel more rigid. 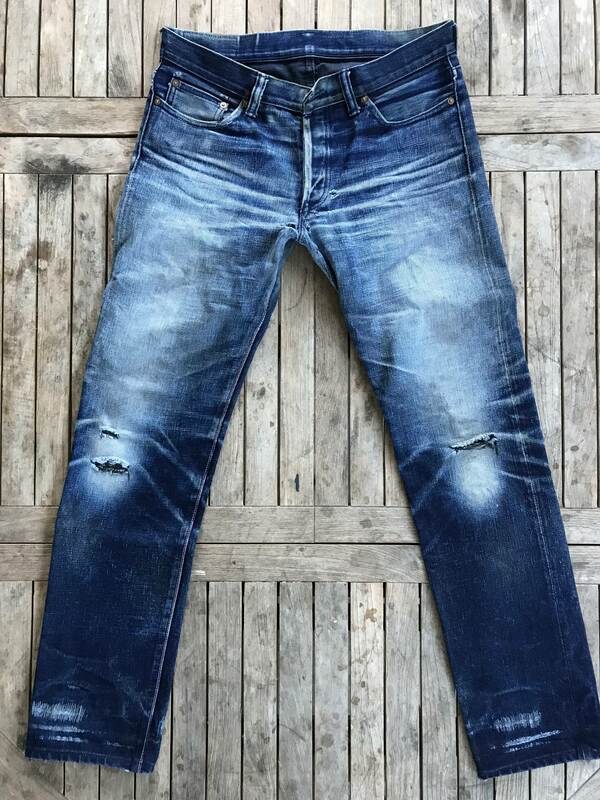 Removing the extra dye will help to increase the stretch of your denim and to give it a softer feel. Prewashing your fabric will also preshrink your fabric so that you won’t have any issues post construction. If you wish to help color-seal your denim at any point (prevent dye bleeding or crocking) use a product called Retayne. Some raw denims are pretreated with an anti-crocking chemical at the mill. There is no way to tell unless the business you purchase your denim from is aware and divulges this information to you. Please note: if you treat your denim with Retayne, vinegar or any other color sealer, you will not be able to break in natural fade lines. DRYING: Putting denim in the dryer isn’t recommended for a couple of reasons but can be done if that is just your way of life. If you ain’t got no time for hang-drying, we recommend pulling it out just before it’s fully dry. This will prevent the heat from damaging the natural oils in the fibers of the cotton, which weakens your denim. POST CONSTRUCTION CARE: Once you’ve prewashed and constructed your jeans using this method you are free to wash at will. It is said that washing your jeans inside out, and as little as possible, as well as hanging them to dry will give your precious work a longer life. Photo credit: Reddit user Even_Keels. Raw denim jeans with 3 years of wear. Here’s the thing you guys – I mean ladies – up until this point the whole raw denim hobbyist culture has been this sort of boys’ club. But taking the time and making the effort to break in a brand new pair of raw denim jeans naturally will produce, hands down THE BEST fades money can’t buy. These jeans will tell the story of you! Each nick, scratch, dye line or cut is produced by you, your body and your lifestyle. The whiskering and distress will be indicative of your lifestyle. In order to go for the full experience, you must have the dedication to wear daily and wash… close to never. But, it’s so worth it. PREWASHING: A store-bought raw denim enthusiast will tell you NOT TO WASH your new jeans for a couple reasons. First, it causes shrinkage and second, it softens them up. But if you are sewing your raw denim using one of our jeans patterns you will want to preshrink your fabric before you start. In order to preshrink your fabric, you will prewash your fabric 2 times in hot water. DO NOT use detergent. Any detergents or softeners will seal in the dye –Not good. Nuh-uh. Not. For. You. Also, be sure to rearrange the fabric between the two washes. Please note: since we are keeping in as much dye as possible, your denim will not be able to reach its maximum stretch using this washing method. With this in mind, do not worry if your pants are a little tight for a while. They will loosen up. DRYING: Hang your damp denim in the bathroom on your shower rod, trying to decrease as many wrinkles as possible. Hanging it to dry will help keep your denim stiff to preserve that initial raw break-in time. Not stiff enough? 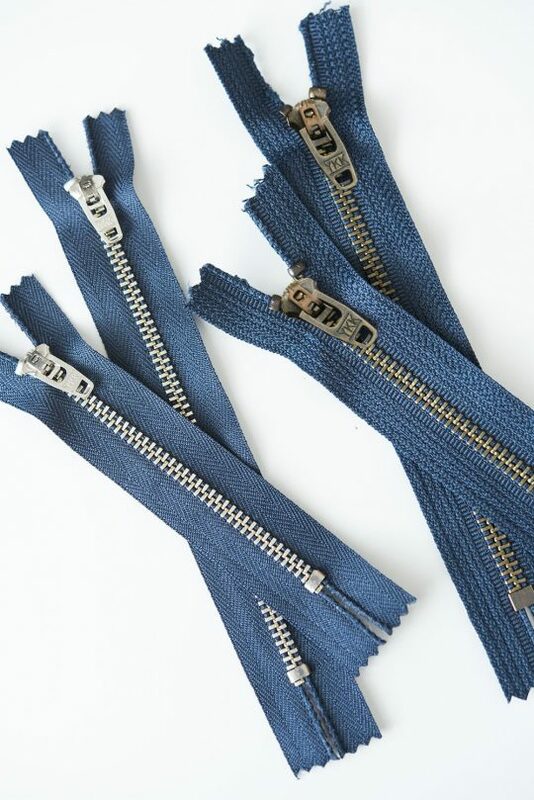 If you want your denim stiffer to help scratch it up with normal wear, you can starch your jeans after sewing them. Now they should have that stiff, crispness that they need to get beat up against everything you touch. Pretty simple. 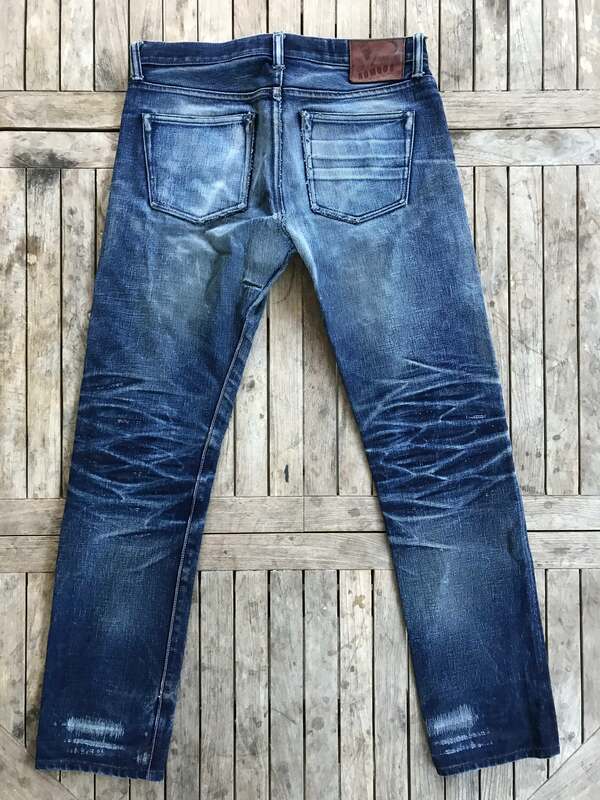 POST CONSTRUCTION CARE: Once you’ve constructed your raw denim jeans you are to go AS LONG AS POSSIBLE, ideally 3-6 months, even up to to a year, without washing the suckers. But why?! When you go for long periods of time without washing, the indigo dye will be rubbed off in various high traffic places on your jeans. Each time you throw them in a washing machine, dye is going to be released and agitated around in the machine. Thus, redistributing that dye and reducing the contrast fade that you have worked so hard for. “My jeans are getting so loose I can’t wear them in public anymore.” Instead of washing them, soak them in a hot bathtub for a couple of hours. The heat will work to shrink the fibers back into place. Hang them to dry. “But I have a stain on them.” In this case, give them a spot clean or take them to the dry cleaners. “They downright SMELL.” Okay, so some will tell you to hang them every day to air out, put them in the freezer to kill the bacteria or maybe to shoot them with some Febreeze. I’m going to give you a pass here and tell you, it’s just time to give them a delicate cold wash, inside out with some Woolite Dark. Keep in mind, each time you wash you are redistributing the indigo and your fades will lessen a little bit. Do you love the look of worn out jeans but don’t want to wait 6 months to break them in? Then the manual distressing method is the way to go! PREWASHING: Wash your raw material ALONE at least 3 times in a row in hot water to help remove most of the excess dye. It will also help shrink it up so you’re ready to sew. DRYING: Once again, we don’t recommend drying the denim, but if you choose to, then dry it on low and pull it out just before it’s bone dry. POST CONSTRUCTION CARE: Once you’ve prewashed, constructed your jeans, and distressed them go ahead and throw them in the wash with some Retayne to seal in the remaining dye. Then you are free to wash at will. And just like before, wash them inside out and as little as possible to make them last longer. DISTRESSING YOUR JEANS: Not sure how to distress them? Watch our distressing video below or check out some other fun ways to customize your jeans at this link!